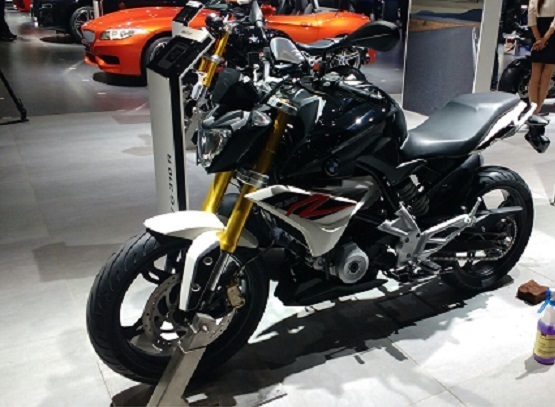 After much anticipation, the first product of TVS and BMW venture, the G310R has been finally showcased in India at the ongoing Delhi Auto Expo 2016. This bike has been developed in Munich by BMW-Motorrad and is produced in India by its cooperation partner TVS Motor Company. Stylish looks, powerful engine and friendly ergonomics sit at the crux of this product. So who does it rival against? It main rival in domestic market are KTM Duke 390, Kawasaki Z250, Benelli TNT 300 and Kawasaki ninja 300, all these bikes have been leading in the entry level sports segment. Cosmetically, the new G-310-R is a 300cc naked sports bike that is compact, has dynamic size and has short wheelbase for those quick maneuvers in city roads. In spite of the clearly visible naked bike character of the BMW G 310 R, the side profile of the bike gives it a sporty style. It has standard USD fork (upside-down fork), sporty single-piece headlamp, muscular fuel tank, gold anodized fork and brake callipers, aluminium swing arm and wide tyres for better grip on the road. Also, when it comes to power output the bike does not disappoints us either, it has water cooled, single-cylinder, 4-stroke engine, four valves, two overhead camshafts, 313cc engine that pumps out 34 bhp of maximum power at 9,500rpm and a peak torque of 28Nm at 7,500rpm. Once fully fuelled it will weigh about 158.5 kgs, and like all BMW motorcycles, the new G 310 R is fitted with ABS as standard. At the front wheel, it has a single-disc brake with radially bolted 4-piston fixed caliper and a brake disc diameter of 300mm that ensures powerful and stable deceleration. At the rear, this function is performed by a 2-piston floating caliper in conjunction with a 240-millimetre brake disc. The G 310 R has fully digitalized instrument cluster that offers wide range of information. Once I was riding bmw bike of my friend, I don't remember which model exactly it was and that day was funny situation. I was driving kind of twenty minutes and than my battery is just dead! Haha I was call my friend for the help and he charged my battery through his car. Later I bought for myself just a car, no more bikes. I find not bad used vehicle, checked the vin code of course through free service https://www.faxvin.com/vin-decoder/jeep/wrangler the reports were good and I could not let this car away... I bought my own first Jeep car.